High above the street, construction workers scale rickety scaffolding without helmets or harnesses. Near the sidewalk, a man welds a piece of metal, his face bare as sparks shoot all around. These are common sights in Turkey, where worker safety often seems to be an afterthought. The horrific death of at least 301 workers in the Soma coal mine disaster last month has put the spotlight on Turkey’s dangerous, under-regulated mining industry, but the construction industry that has fueled the country’s recent economic growth and boosted its global profile is rife with dangers too: One-third of all work accidents reported in Turkey come from the building sector, more than any other industry. 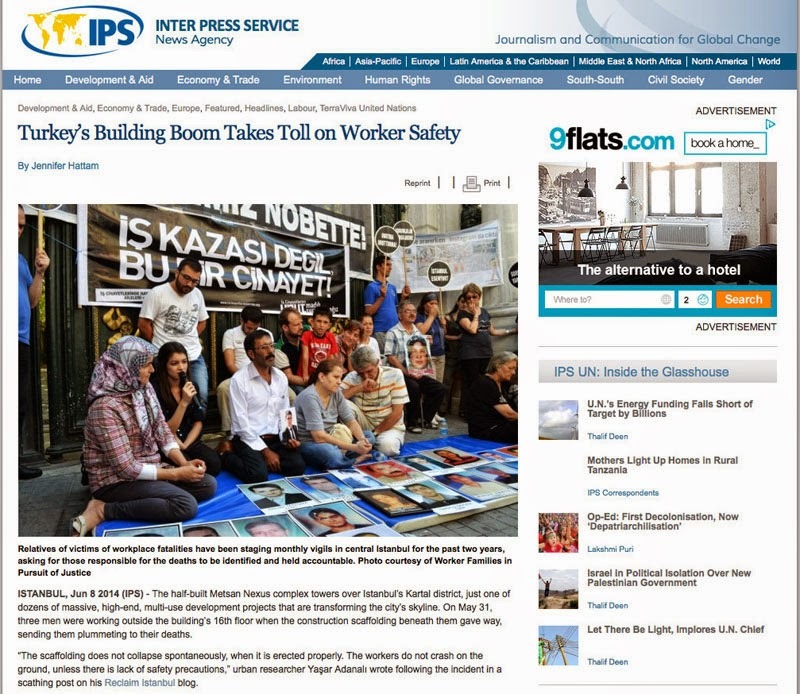 With the deaths in Soma still weighing heavily on my mind, I looked into the safety risks faced by construction workers in Turkey for the Inter Press Service News Agency (IPS), and filed this report: "Turkey's Building Boom Takes Toll on Worker Safety."